The many faces of Josh during the experience. (Yes, we were pulled over and took all pictures at one time.) I know this doesn't seem like that big of a deal to the normal person, but I have been scared to drive since I moved here. THEY DRIVE ON THE OTHER SIDE OF THE ROAD! Look the steering wheel is on the OTHER side of the car. So, what did I learn. Two rules to changing sides of the road. 1. You always pick your passenger up on the side of the road, no matter what country you are in. 2. The driver should always be in the center of the road. I had to keep repeating these rules over and over, but I got the hang of it. I drove most of the weekend. It wasn't near as bad as I thought it would be, It was actually a lot of fun. Most of you can already have a mental picture of me sitting on other side of car, driving, and chanting my rules, but let me add some more fun. 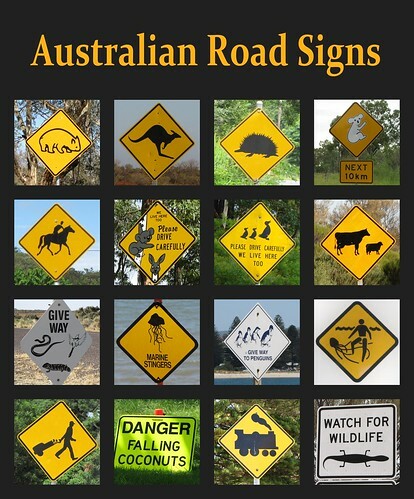 Here are signs we see when driving around Australia. Isn't that so fun? They have trivia posted on the side of the road in fatigue areas. Now, I did not take all of the pictures, but I can say Josh and I have actually seen every sign I posted. We always love to read the signs here, it is free entertainment. I really love it here, and it has really helped that I can now drive. One thing is for sure though, driving made me miss my Jeep! Check out more road trip photos on my Instagram account @eatallovertheworld What are some funny road signs you have seen? You did it. Proud of you.